A Kotaku reader who works for Best Buy sends us pictures for a pre-holiday meeting in Dallas, where they not only got a chance to check out some Gears of War 2 multiplayer, but also got a sneak peak at the Limited Edition pre-order the retailer will be offering exclusively starting October 5th. So the deal is, whoever preorders GOW2 Limited Edition starting October 5th gets a remote control version of a Centaur tank for free! 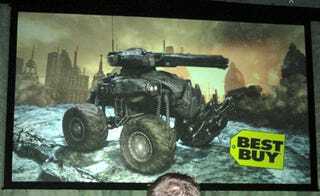 It's a COG vehicle from Gears2 and only available at Best Buy. It's going to be sick. I took a couple of pictures for you guys to check it out. That's actually a rather drool-worthy promo right there, assuming that it is real, of course. Can't take off the rumor tag until official confirmation, but as it stands things are looking pretty good for Best Buy's Gears 2 pre-orders with this baby on their side.